Menopause is a difficult time for many middle aged women as their hormone levels decline, causing a wide range of sensations. They include both physical symptoms, such as hot flashes or fatigue, and psychological symptoms, like depression or memory lapses. It is estimated that over 50% of menopausal women also experience mood swings, and while some of them are able to manage their mood shifts with natural remedies, others experience more severe mood changes and require a pharmacological treatment. 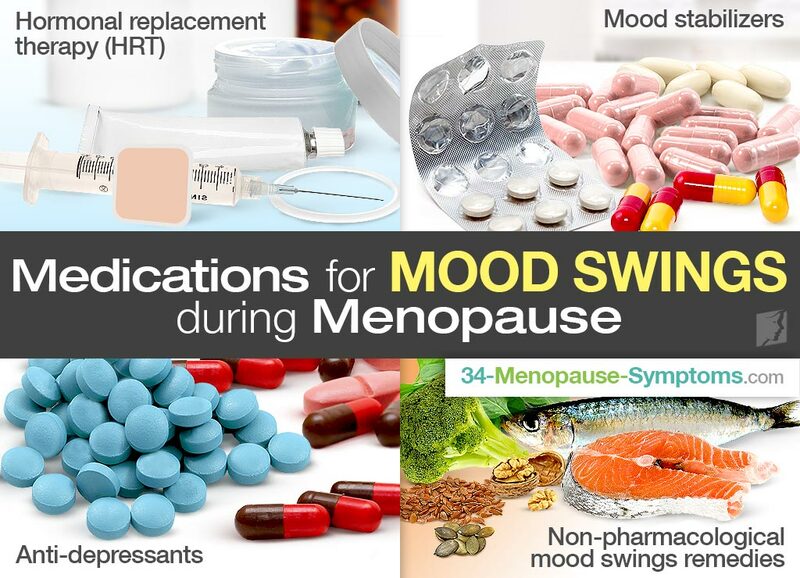 Here are the available medications for mood swings during menopause. It is the most common medication treatment prescribed to relieve severe menopausal symptoms. As the name suggest, it works by replacing hormones, like estrogen or progesterone, which are no longer produced by the body after menopause. Low estrogen levels disturb the serotonin production in the brain, while progesterone abnormalities affect its natural anti-depressant properties, resulting in mood irregularities. There are over 50 types of HRT, all of them with different mechanisms of action and prescribed for different menopausal conditions. HRT should used cautiously, because it has been associated with numerous side effects, ranging from nausea and headaches to stroke and breast cancer. It is a group of psychiatric medications used to manage the episodes of mania and depression, especially in bipolar disorder. The most common mood stabilizers include lithium and several types of anticonvulsants. Each has a different mechanism of action, such as increasing serotonin production or reducing cortisol levels. The most frequently reported side effect of using mood stabilizers is weight gain, but not all of them cause it. A third class of mood stabilizers, called antipsychotics, can also reduce mood swings, but has been linked to adverse effects in elderly women suffering from dementia-related psychosis. They might be used to treat mood swings, depending on their nature. Selective serotonin reuptake inhibitors (SSRIs) are usually prescribed to treat depression and anxiety, but they can help enhance and stabilize the mood in menopausal women suffering from mood shifts. In some women, however; they can have an adverse reaction and induce mania. Several natural compounds have also been associated with mood stabilizing properties. For example, low levels of omega-3 fatty acids make menopausal women prone to depression and suicide. Magnesium deficiency is very common in menopausal women and has been linked to mood swings, while insufficient supplies of choline can cause anxiety and sudden mood changes. These substances can be naturally found in fish, such as salmon, sardines, or mackerel; seeds, like pumpkin, chia, flax; nuts, especially walnuts; green vegetables, such as spinach or broccoli; and many other foods. Experiencing mood swings during menopause can be overwhelming and should be addressed by a doctor, especially if they are accompanied by persistent thoughts of death and committing suicide. Though effective, medications for mood swings are not for all women. You might be interested in learning more about regulating your diet to help control mood swings to help you get through this rough period.